Do wash feet… or hands. The heart of Maundy Thursday, as the church has kept it for centuries, is about following the example and obeying the new commandment of Jesus when he washed his disciples’ feet. The “new commandment” is to “love one another as I have loved you.” And Jesus says he has set the example of washing his disciples’ feet with the expectation we will wash one another’s feet. Washing feet regularly was a necessary in the time of Jesus. The basic shoe was a sandal, and nearly all roads and even many floors in homes were dust. It became a basic act of hospitality to make sure that guests in homes received a footwashing, typically from a child or a servant, as part of their welcome into the home. In modern US and European culture, shoes generally protect from dirt and dust, and roads and floors are relatively dust-free. Many use their hands far more than their feet. For those who work on their feet all day, or lack protective shoes, footwashing remains a powerful sign-act because it is also needed. For others, perhaps hand-washing may be the more needful basic act of physical care. Do share a meal. It doesn’t have to be Holy Communion. The Maundy Thursday story as told by John is of Jesus gathered with his disciples around a meal. In John, this is not specified as a passover meal. Neither, in John’s gospel, is this meal identified as the “institution” of the sacrament of Holy Communion. Indeed, the Western Church (Roman Catholic) established an entirely different festival (Corpus Christi, observed on the Thursday after Trinity Sunday) to observe the founding of that feast. So, don’t feel bound to try to combine footwashing and communion in one service. See our proposed Order of Worship for Maundy Thursday 2017 for a service that places the footwashing the in context of a shared evening meal, instead. As noted above, the Church observes Maundy Thursday not primarily to recall the last supper, but instead, to hear and obey the new commandment of Jesus. We may easily miss this as the focal point if we overload a service primarily about the new commandment and footwashing with a re-enactment of the Last Supper as well. Worse, there is a temptation to substitute re-enactments for the actual Prayer of Great Thanksgiving, turning the prayer of the church into a play.To be sure, there is nothing wrong with a program in which the Last Supper is re-enacted. And many United Methodists have been doing this for years. It just doesn’t belong on Maundy Thursday. So how do we honor some of our local traditions in this matter without getting in the way of what we’re supposed to be doing in the Maundy Thursday service?It’s a matter of scheduling. There may be other occasions during Holy Week when re-enactment of the Last Supper may make much better sense. A service of Tenebrae, either immediately following the Maundy Thursday service or on Friday night, may be one of them. A simple re-enactment could be offered immediately before the beginning of the reading from the passion narrative as background before the reading. The United Methodist Book of Worship (350) has this to say about United Methodists and Seder practices:“United Methodists are encouraged to celebrate the Seder as invited guests in a Jewish home or in consultation with representatives of the Jewish community, thus respecting the integrity of what is a Jewish tradition and continuing the worthy practice of Jews and Christians sharing at table together. Celebrating the modern meal without a Jewish family as host is an affront to Jewish tradition and sometimes creates misunderstanding about the meaning of the Lord’s Supper“ (emphasis added).Why is our General Conference-approved official guidance on this matter so strong? The answer is because it is simply true. Christians hosting a Seder is offensive to many Jewish people, and does nothing to promote deeper understanding either of Judaism or of the Jewish roots of Christianity. And there are important historical and biblical reasons that Christians today should not be presuming to celebrate this festival as if we had some reason to do so. First, any specific connections between the Last Supper and Passover ritual in the time of Jesus are impossible to establish. There are no reliable texts describing Jewish Passover practices until the third century, and there is no way to demonstrate that these texts, which are themselves rather sketchy on some points, reflect what first century practice would have been. Thus, trying to recreate a first-century Seder or imagine what it may have been is just that—an act of imaginative speculation, not an act of responsible historical or liturgical interpretation. Second, what is typically done by Christians in “recreating” a first century Seder with Jesus at the table is to read the more or less current Seder texts back into the first century with Jesus as host. However, Jewish Seder practice today is not based even on the third century texts. Instead, Jewish Seder ritual today, as it has been for centuries, consciously embraces the later history of the development of this rite beginning in the late middle ages. So it is historically irresponsible to try to look at anything like current Seder practices and read any meanings into them them Jesus or early Christians who were also Jewish may have known or intended. Third, Jesus chose perhaps the most non-distinctive elements of the Passover meal — bread and wine, common to all meals — as the signs and bearers of his body and blood in all the biblical accounts of the last supper in the gospels and I Corinthians. Given conflicting accounts between Luke and the others about which cup of wine Jesus used to designate his blood, there is no way to conclude decisively, on biblical grounds, what the meaning of that cup would have been related to a first century Seder, even if we had access to a definitive text. And that’s if we think the last Supper was a Seder. Or that the Christian Eucharist was modeled on the Seder in any meaningful way. Which brings us to the fourth and fifth historical problems. 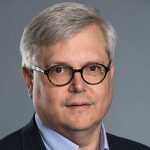 The earliest forms of Christian Eucharistic prayers we have bear no resemblance to anything we see from the third century, much less late medieval or modern Jewish Seder texts. They actually bear far more resemblance to first or third century Jewish thanksgivings for meals in general or for Sabbath meals (Q’iddush). Fifth and finally, John’s Gospel, which we read on Maundy Thursday, describes the events of this night as occurring before the festival of the Passover (John 13:1), while the synoptics (including Luke, which we have read on Palm/Passion Sunday) place the Last Supper as a Passover meal. Passover themes are certainly present in all the gospel accounts and provide some kind of context for the story of the last meal the disciples shared with Jesus. However, these differing accounts in the gospels should make it clear that trying to press any specific actions into any particulars of Jewish Passover ritual of that or any time is problematic at best. So, if you want to celebrate a Seder, you can do that in one of two ways. You can ask a Jewish family or congregation if you might join as a guest. Or your congregation can partner with a rabbi or a Jewish congregation and they can host you at a Seder. If you want to celebrate Maundy Thursday, trust and use our official liturgy in the Book of Worship or the alternatives on your Discipleship Ministries website (such as the one linked above). These reflect the wisdom and scholarship of centuries of Christian faith and practice. Christian-hosted Seders do not. 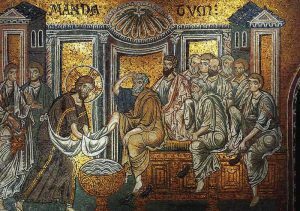 Image Credit: Christ Washes the Disciples’ Feet, Byzantine Mosaic, Monreale. Public Domain.